纤维腺瘤的显微外观。靠右方受压的乳腺纤维结缔组织形成了肿块被膜。肿瘤由纤维化的间质组成，间质中有着扁平的长导管，导管是由呈良性上皮排列而成。 Here is the microscopic appearance of a fibroadenoma. To the right is compressed breast connective tissue forming a "capsule" to this mass. 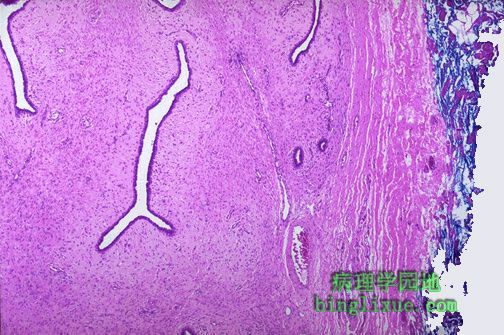 The neoplasm itself is composed of a fibroblastic stroma in which are located elongated compressed ducts lined by benign appearing epithelium.